Jonah's Wedding Florist. Northern Beaches Wedding Flowers. Wedding Florist Jonah’s Whale Beach. Forever one of our favourite Northern Beaches wedding venues, we are extremely proud to be a preferred supplier at Jonah’s at Whale Beach. 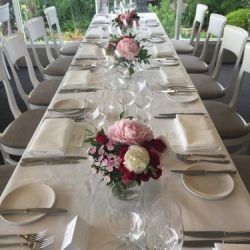 We have had the pleasure of creating beautiful wedding flowers for countless weddings at Jonah’s over the past 10 years – each one unique, and each couple drawn to this beautiful luxurious ocean retreat just as much as we are. 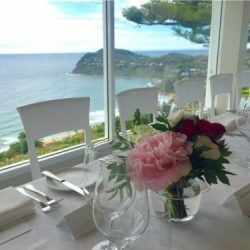 Jonah’s has amazing 180 degree views over the Pacific Ocean, first class service, and a relaxed atmosphere. 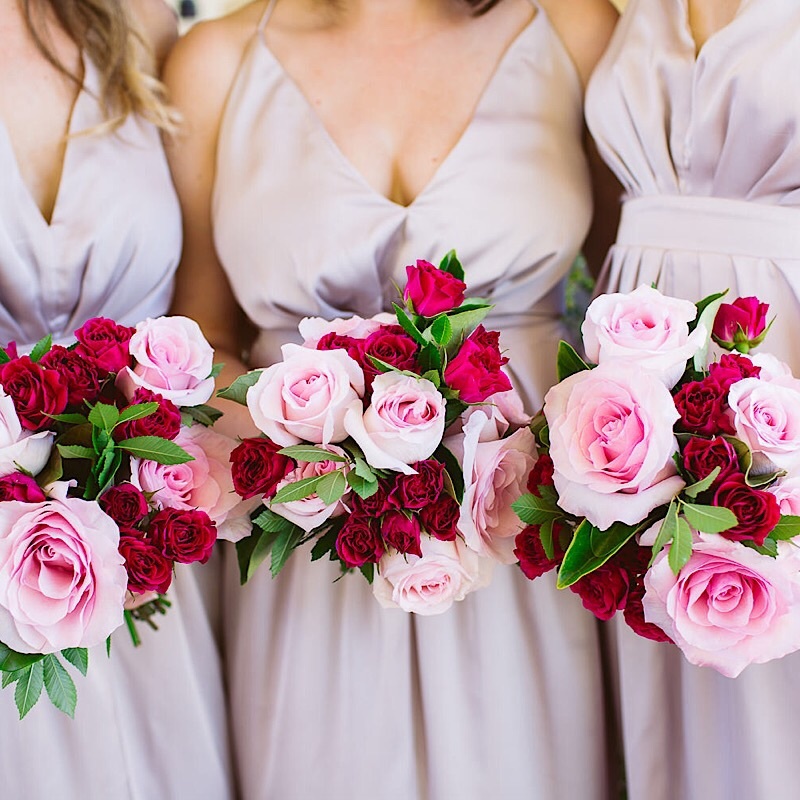 For Lisa and Luke’s spring wedding, we used a palette of hot pink, pale pink and white. 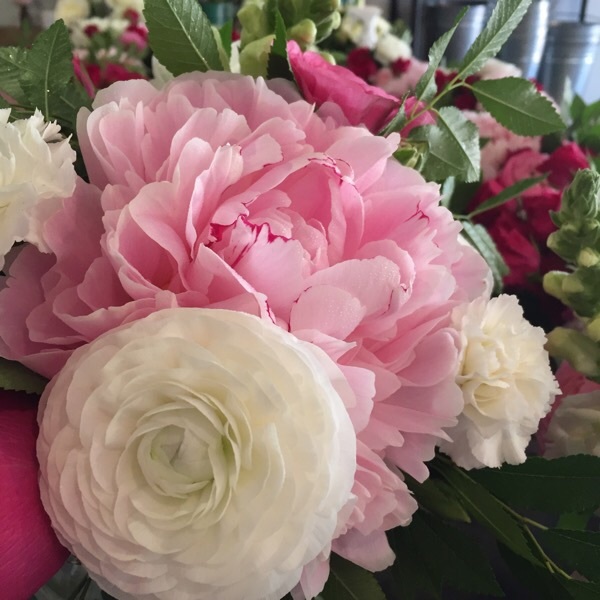 Flowers included roses, peonies, ranunculus, snapdragon, china carnations, sweet william and delicate elm foliage. 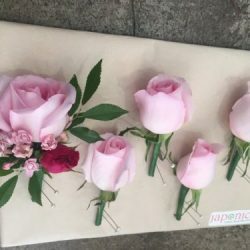 Lisa’s bouquet featured hot pink garden roses, with imported hot pink spray roses, and the bridesmaids had a mix of hot pink and pale pink roses. 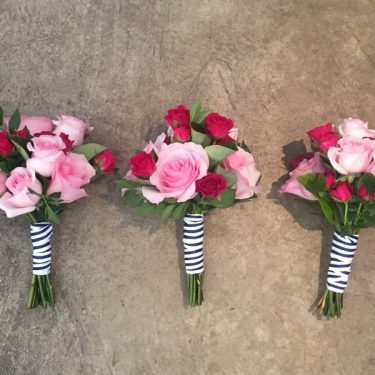 The finishing detail that we just adored was the striped navy and white ribbon. 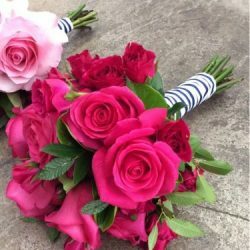 Lisa chose this as the groom and groomsmen wore navy suits, and we agreed that stripes beating timeless and nautical, really suited bathe the bridal party and the venue. 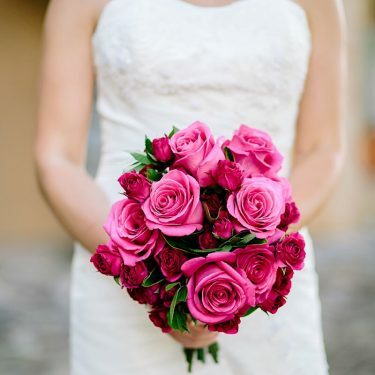 Roses are by far the most popular flower for weddings, and there are many variations. Garden roses in summer, included David Austin roses, imported Colombian roses, hothouse grown standard roses, and spray roses, which are both grown locally and imported. The ceremony focus was the spectacular cliff top views, with a floral arrangement placed on the signing table. 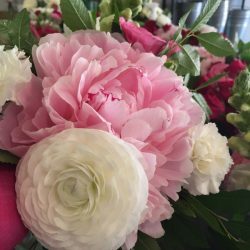 The tables inside the restaurant had 3 – 5 vases each of assorted blooms. We suggest a vase between 4 people (2 on either side of the table) and odd numbers look more balanced, especially on rectangular tables. The bridal table was round, and featured a grouping of 3 vases of slightly different heights. Hot pink and pale pink florals really popped when placed on classic white linen and amongstbeautiful glassware. 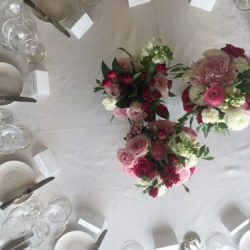 Keeping table settings simple really allows flowers to become the feature of the room – well the second feature here, as the view is definitely the feature! The groom and groomsmen had classic rose buttonholes – the groom with extra detail. 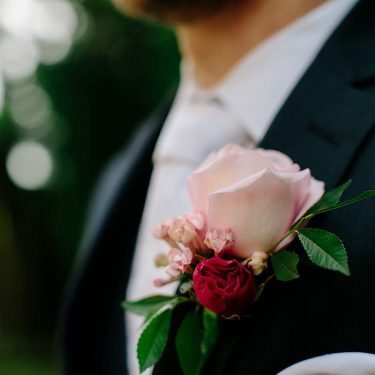 When choosing one type of flower and one colour for all boutonnière it’s nice for the groom to have that point of difference. We thoroughly enjoyed creating this beautiful wedding for Lisa and Luke and wish them all the best for a very happy life together! Contact Jonah’s Whale Beach on 9974 5599 or sales@jonahs.com.au. 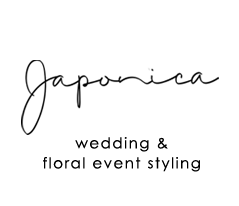 Visit www.jonahs.com.au. Getting married at Jonah’s? We’d love to talk florals with you.